IN 12TH CENTURY JAPAN, the Minamoto and Taira clans vie for power while retired Emperor Go-Shirakawa plays his rivals against one another. One of the three factions will triumph to impose the coming social order. In the shadow of these elite powers, a few ninja scheme to exploit the chaos. Daring raids, skill mastery, and subtle intrigue are essential to establishing oneâ€™s honor. 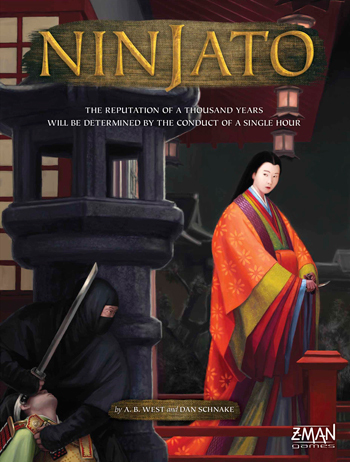 When the new era dawns, one ninja will flourish as the Ninjato, the Invisible Sword of the ruling family. I was initially concerned that this game was too much like Stone Age to warrant a spot in my gaming collection seeing as I already own (and enjoy) SA. These concerns were unfounded! This is a game dripping with theme, and while you will be able to tell that the designers were largely influenced by SA, the press-your-luck element of the house invasions keep this one tense and fresh!